Who’s that singing on the savannah? It’s the top-five ugly animals in Africa! The wildebeest, warthog, vulture, hyena and marabou stork swagger proudly across the savannah, rejoicing in their ugliness – and delighting their babies, who think they’re perfect just the way they are. 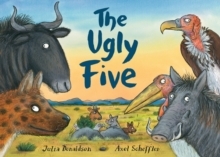 Inspired by the real-life Ugly Five safari animals, Julia Donaldson and Axel Scheffler’s brand-new picture book is a jubilant celebration of animals who are often rather unloved. The funny, heart-warming rhyme is a joy to read aloud, while bold, comical illustrations bring the savannah spectacularly to life.